‘Fall is for Planting.’ Years ago this slogan was developed by the nursery industry to promote fall planting. And fall is a great time for planting, as is spring. Fall brings cooler temperatures, less evaporation, and dormancy for most plants- all contributing to successful installations. Of course there are exceptions to every rule, and a list of ‘Fall Digging Hazards’ developed by Princeton Nurseries highlights this exception. Some of the trees on this list include American Holly and the many Holly hybrids including ‘Nellie Stevens’. Also on the list are Birches, Katsura, Beech, Sweet Gum, Cherry, Plum, most Oaks, Weeping Willow, and Zelkova. So should you only plant these trees in the Spring? The answer is yes and no. Some of these trees will do fine if planted early in the fall- others should be planted later in the fall, and others will be fine if they were dug in the spring and installed in the fall. 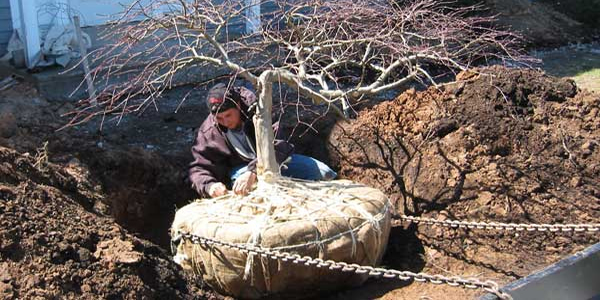 Sometimes containerized trees will be a better option for fall planting since they have the entire rootball intact. Another choice is to wait until spring!